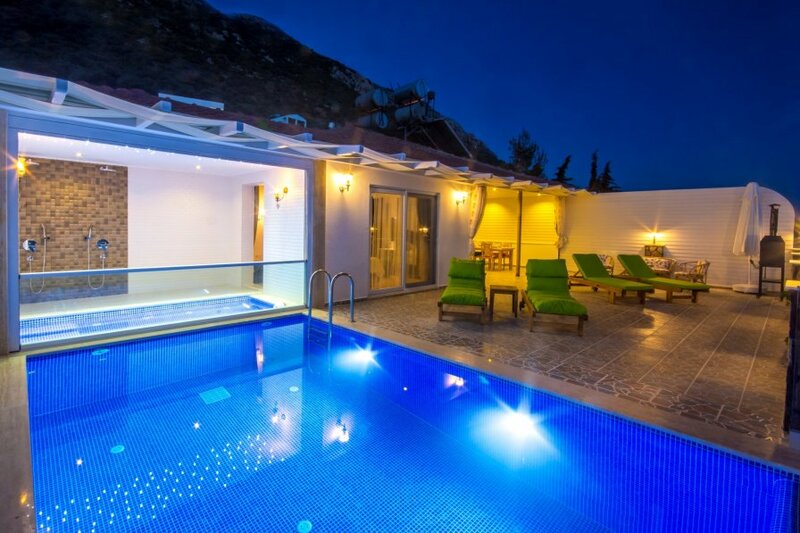 Stylish One bedroom secluded villa with outdoor and indoor pool, in Kördere district of Kalkan. Large pool terrace with everything guests need plus panoramic views over Kalkan Bay. Located on the hillside above Kalkan in the Kordere district, some 3.5 km from the centre, this villa has one double bedroom and a capacity of two guests. The property is air-conditioned throughout, has a fully equipped kitchen, and is decorated to maximize the comfort of guests. The WC is accessed form the living area and there is a shower in the pool room adjacent to the bedroom. The pool terrace in particular has magnificent views out across Kalkan Bay, and has everything guests need to maximize their enjoyment of this view. Specifically designed for honeymoon couples, this villa is completely private from the outside world. In addition to having a generous outdoor area with sunbeds, dining table, BBQ, swing and good sized outdoor pool, (6.5 x 3.1 metres, depth 1.48 metres), it has a small heated indoor pool, (3 x 1.5 metres, depth 1 metre), with Jacuzzi feature and seating ledge, adjacent to the bedroom. This indoor pool room has a remote controlled sliding glass panel which can be lowered in the summer months. The extra charge for heating this pool is only £60 per week, thus making it an ideal location for honeymooners particularly in the cooler months of the year. Due to distance from the town centre many guests prefer to have the use of a vehicle whilst staying at this property, but some manage to get about by using the relatively inexpensive local taxis.